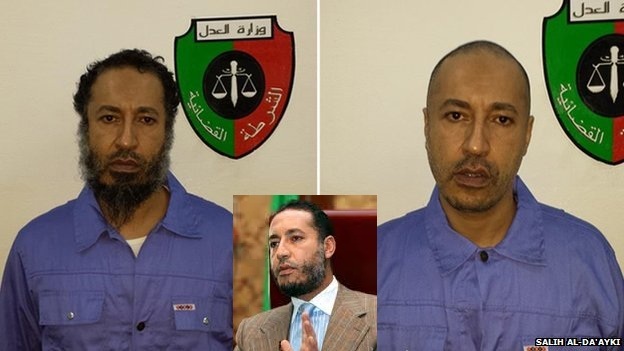 JNN 07 Mar 2014 Tripoli : Saadi Gaddafi, the son of Libya’s slain dictator Muammar Gaddafi, has been extradited from Niger and is now in government custody in Tripoli. The government made the announcement in a message on Facebook that thanked the president of neighboring Niger for his cooperation, CNN reported. Saadi Gaddaf fled to Niger, where he was granted asylum after an uprising ousted his father from power. The Libyan government also thanked Niger for its cooperation in extraditing Gaddafi’s 40-year-old son, who had fled to Niger across the Sahara Desert following the ouster and killing of his father in the 2011 uprising. Niger had previously refused to hand over Gaddafi’s son. According to reports, Gaddafi’s third son, who was a professional footballer, is not wanted by the International Criminal Court (ICC) but the Libyan government wants to try him over allegedly misappropriating property by force and for alleged armed intimidation when he headed the Football Federation in Libya. Saadi’s brother, Seif al-Islam, has been in custody of a local militia in Libya’s western town of Zintan since November 2011. Unlike Saadi, the ICC has indicted Saif al-Islam for crimes against humanity but the militia has so far refused to hand him over for a separate trial in Tripoli. During the uprising, he made an offer to negotiate with the rebels and sounded prepared to cut loose his father and one of his brothers, Saif al-Islam Gaddafi, often assumed to be his father’s heir apparent. Saif al-Islam Gaddafi was captured by rebel forces during the uprising. Two more of Moammar Gaddafi’s sons were killed during the rebellion. Saif al-Arab Gaddafi died in a NATO airstrike in spring 2011 and Khamis Gaddafi was killed in a battle in Northwestern Libya that August, rebel commanders said. Around the time of his death, troops commanded by Khamis Gaddafi killed an estimated 150 captive civilians, during a retreat, hurling grenades and spraying bullets into a building full of men they had promised to release, a survivor said. A further son, Mutassim Gaddafi, died in October 2011. The former dictator’s wife Safia fled with sons Mohammed, Hannibal and daughter Aisha to neighboring Algeria in late August 2011, along with extended family members. They reportedly left there for Oman, where they were granted asylum. Libyans rose up against Muammar Gaddafi’s four-decade rule in February 2011 and deposed him in August 2011. He was slain on October 20 of the same year. This entry was posted in AFRICA and tagged Extradites, Moammar Gaddafi, Muammar Gaddafi, Niger, Saadi Gadaafi, Saadi Gaddafi. Bookmark the permalink.